The S3DA1G512BT28HPCP employs a current steering architecture with differential current outputs. It uses 6 linear bits and 6 binary bits, all of which are generated from within the current source array. This segmentation results in an excellent static performance and reduced glitch energy at the output. This also ensures parasitics within the DAC are minimized. Furthermore, the distortion at the output is greatly reduced by using propriety latch architecture. 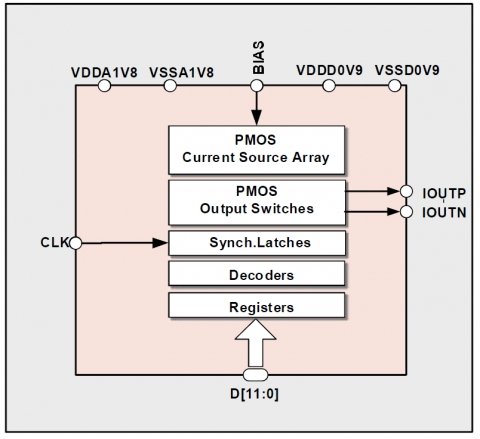 The 12-bit DAC dynamic performance highlights considering a signal frequency of 150MHz and 1430MS/s conversion rate include an SNDR > 62dB and an SFDR > 63dBc. The S3DA1G512BT28HPCP is designed in a 28nm logic process, which is ideal for integration with a DSP engine, and can be cost-effectively ported across foundries and process nodes upon request.